The WorkCycles Fr8 (pronounced “Freight”) is our modular range of heavy-duty transport bicycles based around two versatile and super-sturdy frames. Unlike most so-called “transport” bikes the Fr8 is a genuine workhorse. 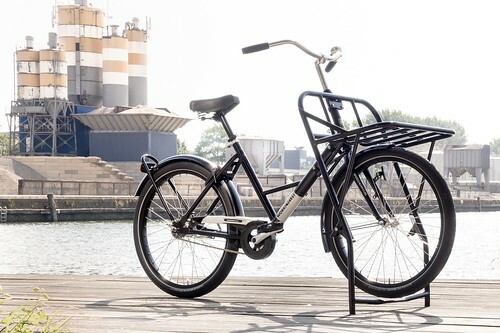 Everything about the Workcycles Fr8, including the geometry, generous clearances, fittings and materials has been developed to create the toughest, most stable and convenient bicycle possible. It happens to ride beautifully too, regardless of what you pile on. The Fr8 is also available with a powerful and smooth mid motor electric assist. The Fr8 V8 enables you to ride further, with greater loads and in hillier terrain. 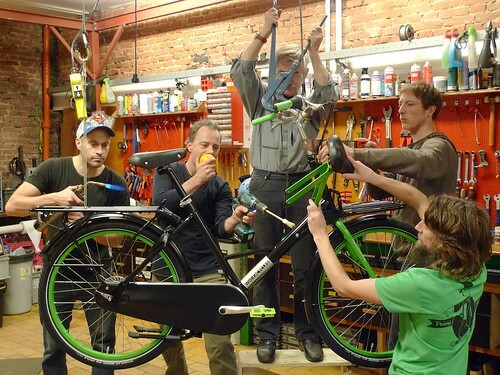 Here’s the WorkCycles website showing the Fr8 amongst other WorkCycles bikes. 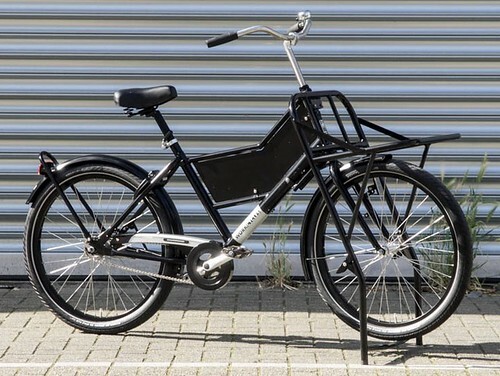 Like all WorkCycles bikes the Fr8 is hand built in the Netherlands. This enables us to use the special parts and finishes required for heavy-duty bicycles, maintain top quality and provide flexibility to build bikes to suit each customer’s needs. By choosing from various componentry variants, front and rear carriers, boxes and other options each Fr8 can be configured for many applications. 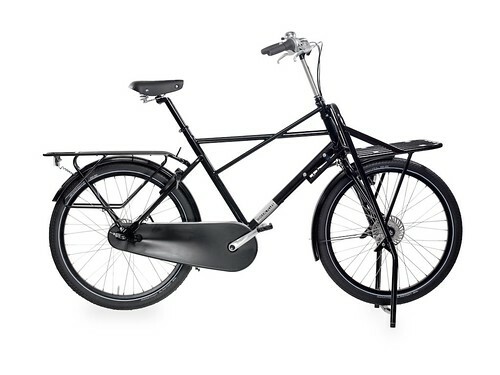 Thus all of the Fr8 models referred to on the WorkCycles website are essentially variations of the same bicycle; You can even build unique combinations such as a family bike with the delivery style Massive Rack front carrier or a stripped-down Fr8 Cross-frame as a city bike for a huge rider. The Fr8 can carry up to three kids: one or two on the rear carrier and one either in a child seat or saddle behind the handlebar. There’ll still be plenty of room for mom’s or dad’s knees and groceries on the front carrier. Carrying two or even three kids without a bakfiets has never been so easy. 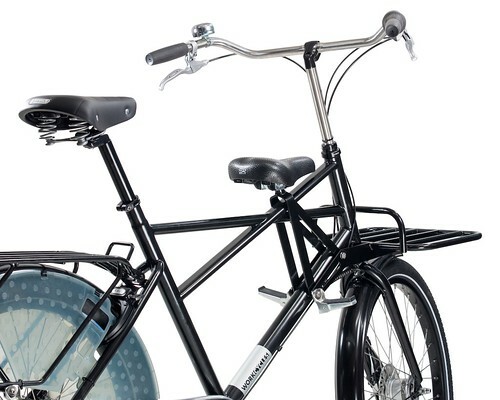 The industrial Fr8 models are as bombproof, low maintenance and safe as a bicycle can be. The “Massive Rack” front carrier with stable and smooth working integrated parking stand can carry at least 150kg. Boxes of up to 95 liters can be fitted to the “Massive Rack” front carrier, and the extended rear carrier can take even the biggest delivery panniers along. Special carriers can also be built to integrate the existing bins and cases of parcel and delivery services. Even with huge loads the Fr8 handles predictably and safely. The Fr8 is strong enough for the heaviest “Clydsedale” riders. The fat tires, low instep and spacious frame geometry make it extremely comfortable. The Fr8 even looks good under “people of large stature”. Thanks to the special, universal ergonomics the Fr8 Cross frame fits riders from 170cm to about 215cm (5’7” to 7’) regardless of what they weigh. For most really tall folks their initial ride on the Fr8 is the first time they’ve ever sat comfortably on a bicycle. The Fr8 is not just one or a collection of bikes; It’s a modular system of parts that can almost universally be interchanged and combined. That means you can carry kids on your Fr8 delivery bike, use the bike for multiple purposes or swap carriers to repurpose your Fr8 when your needs change. The sitting position is comfortably upright. Both Fr8 frame types feature a proprietary (and protected) geometry called the “Adaptive Seat Tube”. The handlebar reach and reactionship to the pedals actually vary accordingly with the height of the saddle. To state it simply: A woman of 160cm feels as comfortable on the Fr8 as a man of 200cm. The Fr8 Universal frame reliably fits riders from about 155cm to 200cm and the Cross frame fits from about 170cm to well, we haven’t yet met a guy too big. This makes the Fr8 an ideal bicycle to share; amongst employees, within a family or with your customers. Very large diameter, 4130 chrome-moly tubing makes the Fr8 frame far stiffer, stronger and more corrosion resistant than frames from other manufacturers. The front fork is also chrome-moly steel with oversized steering tube and blades. Each frame is guaranteed for 10 years though after nine years of production and thousands of Fr8’s in daily service nobody has yet managed to bend or break a Fr8 frame or fork! Mounting carriers and accessories to the Fr8 is easy because the fittings are cleanly integrated in the frame: front and rear carriers, steering stabilizer, storage box, child seats and footrests. Accessories developed in the future will use the same fittings as well. Naturally all fittings for control cables, brake reaction arms and lighting are also integrated into the frame and fork. The Fr8 front carriers are solidly affixed to the frame so they don’t turn with the handlebars and front wheel. Loads have almost no influence on steering and the bike stands solidly when parked. Thanks to the Fr8’s unique frame geometry it handles easily and safely even with very heavy loads or squirming kids. On other bicycles changing rear tires and inner tubes is a time consuming job requiring an experienced (preferably Dutch) mechanic. The Fr8’s proprietary Escape Hatch enables the rear tire to be changed quickly, without touching the enclosed drivetrain. The Fr8 rolls on super durable wheels with box-section, aluminium rims, 2,3mm stainless spokes and smooth riding, highly puncture resistant 55mm wide balloon tires. The handlebar, stem, brake/gear cables, spokes and almost all of the nuts, bolts and washers are made of stainless steel so they won’t rust even when stored outdoors for years. Fr8’s have sealed internal hub gears (2, 3, 8, 11 or NuVinci CVT) with either a rear coaster (backpedal) brake or roller (hand) brake. They offer foolproof shifting even while stopped, require minimal maintenance and are out of harm’s way. Industrial variants keep it simple with a super tough, automatic shifting, 2-speed SRAM coaster brake. Road-going models are normally equipped with Shimano front roller brakes (a low maintenance type of drum brake) unaffected by weather and your choice of either rear coaster or roller brake. For those in hillier areas and for the Fr8 V8 with electric assist powerful Magura hydraulic rim brakes are available. The sealed chain-case means no dirty trousers and almost no chain maintenance. 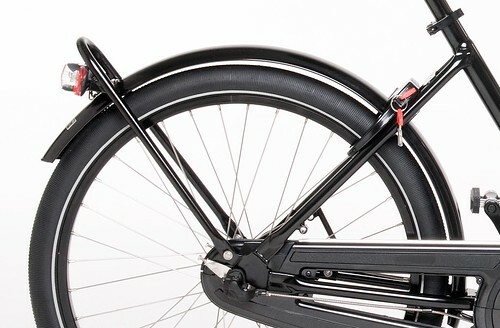 The mudguards are tough, powder coated stainless steel to take a beating and never rust. There is no need to wear special clothes to ride the Fr8. Fr8 City bikes are equipped with bright, reliable and silent running lighting systems that require no batteries. The front hub dynamo (generator) runs silently without noticeable drag. The B&M headlamp has a powerful LED with a clean beam pattern. The tail-lamps have LEDs with a 100,000 hour life-span and remains on for a few minutes while stopped (called “standlight”). Double wiring is routed though the fork, frame and rear mudguard where it’s invisible and out of harm’s way. An even more powerful headlamp with stand light is optional. There are two Fr8 frame styles available. Both are strong enough for the roughest use and have the same special geometry that makes the Fr8 ride so well under so many conditions. All Fr8 carriers and parts fit either frame with the exception of the advertising board that only fits the Universal frame. As its name suggests this is the ideal frame for most applications. The Universal has a low instep for convenience but is as suitable for men as for women. It adjusts to properly fit almost everybody; riders from about 155cm to 200cm (5’3” to 6’6”). With a longer seat post it’ll even fit taller riders. The Fr8 Cross is a men’s style frame that fits riders from about 170cm to about 215cm (5’7” to 7’). The crossed top-tubes enable the same stand-over height as a 58cm frame while the saddle and handlebars can be adjusted to the equivalent of frame sizes more than 75cm tall. These are the basic build packages available. The City models are for general use on public roads, while Industry versions are for factories, around plants and other closed terrains. Our most popular Fr8 models are equipped with the Shimano Nexus 8 speed hubs.The 8sp hub offers a wide enough gear range for most situations. It’s smooth running and tough. The large, thick hub flanges help us build particularly durable rear wheels. Both NN8D and NR8D include a front rollerbrake (hand operated). The NN8D has a rear hand brake while the NR8D has a coaster (backpedal) brake. These models are the same as above but with less expensive three speed gearing. You’ll mostly use the direct-drive second gear, but the 33% reduction first gear can be very handy. The 33% overdrive third gear is for the occasional tailwind or downhill grade. 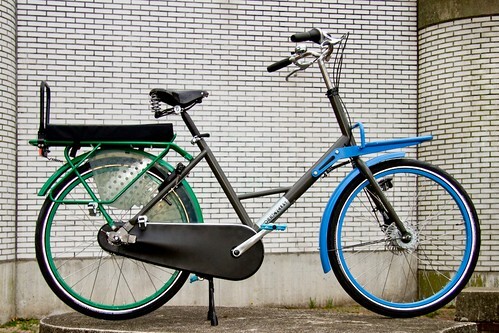 Again, both versions have a front rollerbrake. 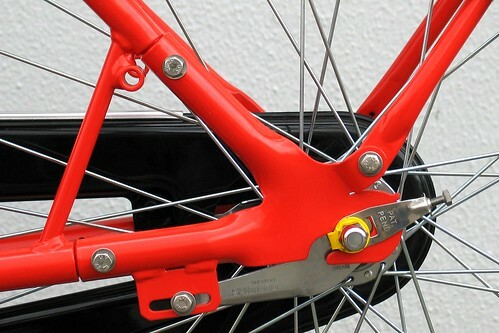 NR3D has rear coaster brake (backpedal) and the NN3D has a rear rollerbrake. The City NNiD features the super strong and smooth NuVinci N380 Constantly Variable Transmission. This unique drivetrain actually has no steps at all between ratios. You can turn the shifter a tiny bit and change your “gear” by say 1%, which is really nice. The range of ratios is also greater than the Shimano 8sp: 380% vs. 305%. Probably the biggest feature of the NuVinci is its extreme durability, thus we build most Fr8 V8 (electric assist) bikes with the NuVinci hub. For those needing (or wanting) far more braking power than Shimano Rollerbrakes we offer the fantastic Magura HS11 hydraulic rim brakes in combination with the 3sp, 8sp and NuVinci options. These are extremely reliable and low maintenance brakes but they do require occasional pad replacement. Only available with the Magura brakes is the Shimano Alfine 11sp hub (HH11D). This hub offers both the widest range (408%) and the most efficient power transmission. The Fr8 for internal transport, stripped of all but the essentials and as heavy-duty as possible: extraordinarily strong wheels, an automatic shifting, 2-speed coaster brake, no cables or lights and nearly flat-proof tires. The Fr8 Industry also has a special heavy duty chain, abuse resistant open chain guard and nearly indestructible saddle. 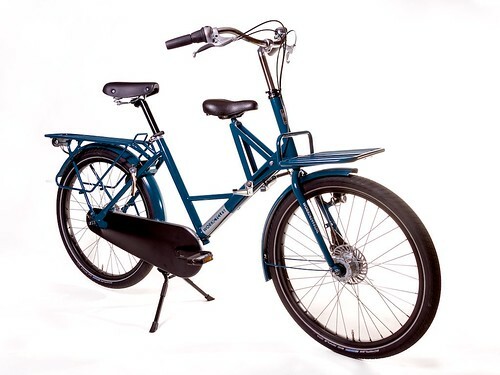 This is the same as above, except with a Shimano front roller brake and simple hub dynamo lighting system to make it street-legal in most European countries. Though the Industry is acceptable for road use the City models are far better equipped all-around city bikes. 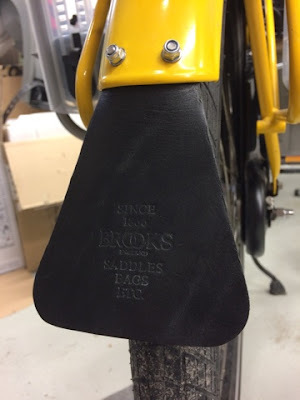 Brooks leather saddles are beautiful, durable and gradually form to their owner’s anatomy. They can last years if cared for, but a leather saddle can be permanently stretched out by being ridden wet too much. B67 is the standard size, while the “S” designates the “slightly shorter” or ladies’ versions. Brown is standard. Honey and Black sometimes available, maybe for small additional fee. In some cities a saddle with a quick-release will get stolen, so we can fit a small cable from the frame to the saddle. It’s discrete and allows room for adjustment. The standard Fr8 handlebar is called the “Moon” bend and most riders prefer it for its leverage, comfortable wrist position and clearance around child seats. We also offer the square bend “Transport” handlebar; more traditional looking and with more pullback toward the rider, providing a very upright position. Neither handlebar is “better”; it’s a matter of taste. For an extra charge the Fr8 can be powder-coated in your choice of one or more colors. The special color fee applies whether we paint an entire bike or just one part. We also periodically have a batch of frames and parts painted in a color we think is nice. For lack or a better description we call these “Seasonal Colors” and charge only half as much as the custom color option. Just ask what the current seasonal colors are. 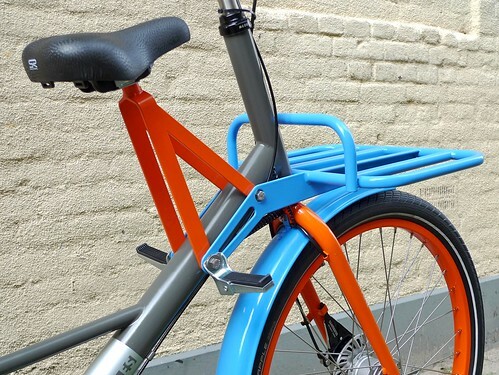 And if that doesn’t make it hard enough to decide we also keep a stock of carriers, child saddle frames and even some rims and fenders in many fun colors so you can mix and match. We normally just charge a half hour labor fee to swap out the carriers for another color, and an hour labor fee for the rims or fenders. Note that we are limited to colors from the “RAL Classic” range (about 200 options). Most corporate graphics are specified from the Pantone system so it’s your responsibility to choose the best match in the RAL system. This is something we are not qualified or equipped to do. With this addition the Fr8 Universal frame gets a large advertising surface. Note that it effectively converts the frame into a “men’s” type frame, though one with a fairly low instep. Tough steel construction. Workcycles can also put your graphics on the board for an additional cost. We can even weld custom nameplates into the Fr8 frame. This is handy to identify fleet bikes or fun to personalize your own bike. Maybe it’s a theft deterrent or will at least help you recover your bike if it’s stolen. Maybe that’s wishful thinking. Maximum six characters. 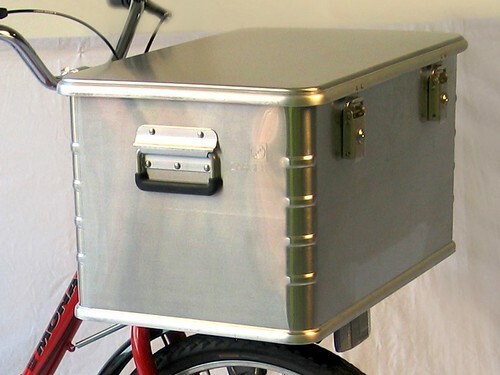 Probably never before has so much attention been focused on producing such strong, versatile, good riding cargo carriers for a bicycle… and conversely on designing a bicycle to carry such large loads. All Fr8 load carriers are very securely bolted into the frame where they have almost no effect on steering. The “mother ship” of front racks, the Massive Rack is a huge carrier strong enough for any load you dare pedal. A rock-stable and smooth working parking stand folds up behind the front wheel. The carrier surface fits Euro-norm 60 x 40cm boxes and bins perfectly. The Massive Rack was designed for industry and delivery but its also brilliant for daily transportation. Carry a couple friends to the pub if you like. This frame-mounted, medium-sized, front carrier is extremely handy and basically indestructible. It’s ideal for urban use, for example in combination with child seats. It’s also perfect for business use when the loads don’t warrant the Massive Rack. 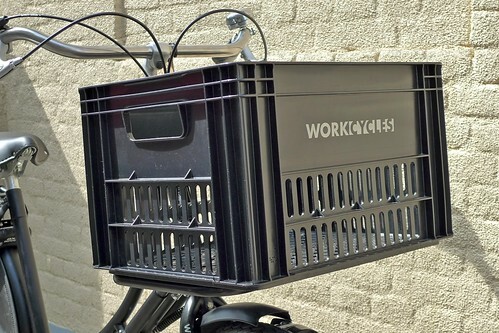 Typically a crate, box or basket is mounted on the City carrier and because it is affixed to the frame the load has no influence on the bike’s handling or parking stability. Fr8 bikes not equipped with the Massive Rack need a parking stand. The stand has a very wide stance for stability but folds inward when not in use. The Fr8 rear carrier is long, strong and versatile. While most rear carriers seem to be installed just to fulfill the expectation that a bike has one, the Fr8 carrier is a carefully engineered basis for either delivery or child transport. The carrier is long and stiff enough to ride stably with big newspaper delivery panniers. Pannier support frames keep heavily loaded bags away from the rear wheel. The excellent Qibbel rear seats clamp right on (and are our top recommendation). Bobike Maxi or Junior child seats can also be easily installed onto an integrated mounting point. WorkCycles double rear seat setup is the simplest way to carry two older kids (6+); it includes a long cushion, a backrest and two sets of folding footrests. No problem. An Fr8 with front carrier doesn’t necessarily need a rear carrier. The rear mudguard and taillamp/reflector will be mounted on an extremely sturdy tubular “bumper” instead. Below are some popular examples of bags, baskets, bins, boxes, cases and crates that can be combined with the Fr8 carriers to move your goods around. This lightweight, weather-sealed box with a locking lid fits nicely on the Massive Rack. It’s 60 x 40 x 33cm tall, making it great for deliveries, carrying tools or just doing (lots of) groceries. These indestructible 60 x 40cm plastic industrial boxes fit perfectly into the Massive Rack. We have them 22cm or 33cm tall in light gray, red, blue and (recycled) dark gray. A simple hinged lid is available. A tough, black plastic box that fits the Pickup rack perfectly. It’s 50 x 30 x 20cm tall. When combined with a front child seat we cut away part of the MT crate’s rear panel for foot clearance. The perforated Dutch milk crate is a favorite in Amsterdam. Ugly, indestructible, black plastic. It’s 43 x 35 x 27cm tall. 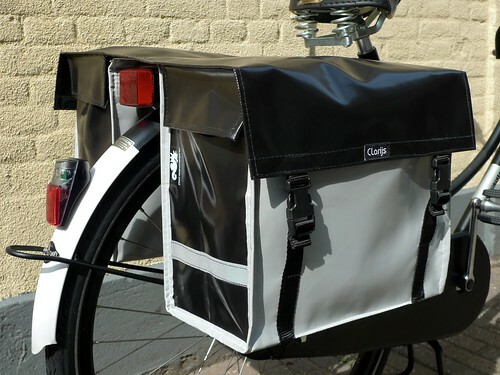 Simple, functional and waterproof panniers hand made by our friends in Zeeland in a dazzling array of color combinations. European truck tarp material (“Bisonyl”). 46 liters big. Highly customizable including many colors and combinations, rings for locks, cutouts for child seats, hand-cut flowers, insert shopper bags, printed business graphics… We always have a random bunch of examples in stock or you can design your own. The Fr8 is an ideal child transport bike. In fact it’s something of a cult object in Amsterdam. The long frame has plenty of room for even tall parents and children. The Fr8’s extreme stiffness, transport-bike geometry and fat tires translate into amazingly stable, safe cycling even when loaded with squirming kids and groceries. The low cranks and shallow seat angle keep you close to the ground for easy mounts and dismounts. All of the accessories needed to carry various combinations of kids have been designed to bolt on securely and without fuss. Smaller children from about 9 months old to about 15kg can ride in a front seat which is nicest for both child and parent. Rear seats are used for kids from 9 months to about 9 years old or 35kg. Front and rear seats can be used together. Child transport is too extensive and important a topic to cover in detail here but below is a quick overview of the options. Contact us to discuss your specific needs. This saddle and footrests behind the handlebar is the sweetest way to carry a child mature enough to hold on securely. You can easily talk with your child and they see the world from your perspective. Kids really love riding here and the bike handles better than with the child in the rear. The saddle frame bolts securely to the integrated mounts on the Fr8 down-tube, fits both Universal and Cross frames and can be with or without the front carrier. For what age range is the Fr8 child saddle suitable? Here in the NL kids start at about two years old and don’t generally outgrow it before they’re riding their own bikes around town. Some customers even say that mom sits there occasionally for a romantic ride with dad. The Mini looks a little old fashioned compared to the newer Yepp Mini but it’s still our favorite front seat. The biggest plus of the Bobike is that the footrests are tucked in nicely so it works much better in combination with a front crate than the more voluminous Yepp. Mounting is simple. The Mini fits all Fr8 variants except one with the Massive Rack. There are various accessories such as the windscreen to keep baby (and parent) warm and dry, and a little handlebar/sleeping pad. Additional mounting blocks are available to use the Mini on other bikes as well. The Yepp seats are made of that skinned foam stuff that Crocs made so popular and it’s ideal for a child seat because it’s soft and absorbs no water. The Yepp also incorporates nice features such as a secure five point harness and quickly adjustable footrests. 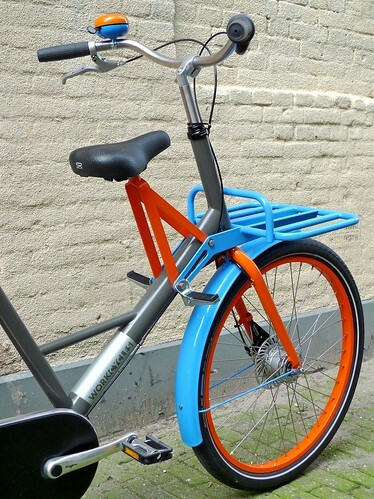 Like the Bobike Mini there’s a windscreen available and the Yepp also comes in several colors. This is our favorite car seat for younger kids on the Fr8 and Gr8. It fits perfectly with a minimum of hardware, is adjustable in angle and is generally just a nicely designed and made seat. The pads, by some miracle of textile engineering, don’t absorb water. Foot protectors are built in so the Fr8 footguards aren’t necessary with this seat. As the name implies this minimalist seat is for kids six and older. It fits the Fr8 rear carrier perfectly. The Qibbel footrests are junk so we include our own in our kit. Foot-guards MUST be fitted as well. Essentially very strong, broad dress guards fitted to the mudguard on either side of the rear wheel to keep little feet away from the spokes. The guards are unobtrusive in tough transparent/smoke plastic. To order or for more information please contact us. I use a FR8 with 2 kids the same age as yours, and sometimes strap one of their bikes either on the box in the front carrier or on the child seat in the back. However these are not ideal solutions and only work for one bike. 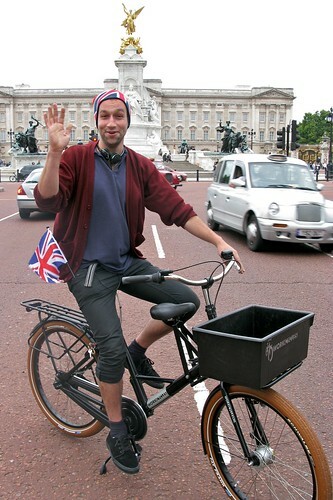 You can use a more solid solution as Henry suggests, but those seem to work also only for one bike. Of cause you can somehow fix one to the front, the other one strapped to the rear carrier, but your ride will become very heavy and awkward. I sometimes struggle on smaller hills with the 2 kids plus stuff in the box, so depending on the details of your ride you will need to consider seriously how comfortable you will still be able to cycle. That is really useful feedback, thank you. I have lots to consider. Of course the Fr8 has it’s own child saddle in front setup so you don’t need to hack your bike up with an aftermarket kit like the one above. Will the Qibbel junior mount in tandem with a GMG 911 or are two GMG 911s still the only way to do two seats on the back of the Fr8? For kids six and up we have our own double seater setup now. It’s very simply a long cushion, two sets of sturdy folding footrests and a backrest. I have a question about the city front carrier. 3) Rount metal, looks like it slips into 2 round receivers on the frame (picture of the crossframe with the white tires. The City carrier with the sheet metal mounting construction is the current version. It is stronger, lighter and handier than the older version which no longer make. …and the version that fits into a stainless bracket on the frame is even older. That one is also no longer made. So the prettiest one is the current version. That makes me happy. Will come to the store soon for a testride. Ideally I would add the long rear carrier and Clarijs cargo panniers. 2. Do you have or is it possible to construct a flight deck for the rear carrier? 3. What about skirts or spoke covers, foot pegs, and stoker bars? 1. Yes, we build Fr8’s with front hub motors and are also testing mid-motors for the future. The 8Fun/Bafang (same thing) will fit but not with the chaincase. The Sunstar will probably also fit but we haven’t tried it yet. The Nuvinci CVT is the recommended hub in combination with a mid-motor but the Shimano Nexus 8sp Premium will work too. 2. What is a “flight deck”? 3. We have all those things except “stoker bars”. Stoker bars? The Fr8 is not a tandem. Just send a note from the Fr8 page on the WorkCycles website for the options/price sheet. Thank you for your quick reply and information. I’ll send a note from the Fr8 page for price and options as you recommended. Flight deck is a wood or plastic board that attaches to the top of the rear rack for passengers or cargo to sit and ride upon on long-tail and some mid-tail cargo bicycles. 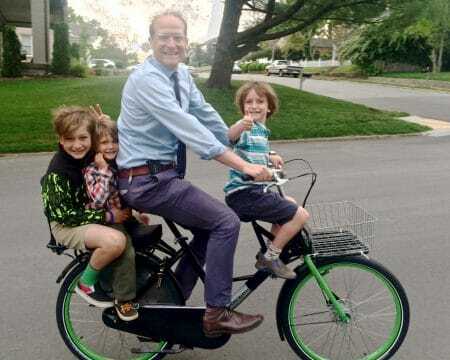 Stoker bars are smaller handle bars that attach to the drivers seat post and used by children to hold onto – as if they were on a tandem but of course they are not pedaling – very common in the U.S. on family cargo bicycles. In general, I’m looking for a bicycle that I can transport two older kids a moderate distance with a fairly steep uphill (thus the electric assist), then commute mostly downhill 9 miles to work with uphills back at the end of a long day (electric assist), then; run local errands, weekend recreation and short tours. Oh yeah, has to withstand, rain, snow, humidity, potholes, and more. In short, tough, practical, affordable. Is it possible to leave the front child saddle in place while using the Yepp mini? What do you think about the Qibbel frontseat? Yes you can ride with both the little saddle and a front child seat in place. Some Fr8 riders do this so they can ride with either a baby or older child up front. The Qibbel front seat is very good but doesn’t fit any bike with a frame-mounted front carrier. The Yepp has some nice features but also fits very poorly on bikes with any front carrier. The simpler, cheaper Bobike is still the best bet for any bike with a front carrier. Unfortunately Bobike (now owned by Polisport in Portugal) has just changed the Mini moving the footrests further forward and outward, copying the Yepp. Now there is no front seat really suitable for bikes with a front carrier. Yes, no problem to leave the front saddle on the bike while riding with a smaller child in a front seat. There’s at least a few centimeters space between them. The Qibbel front seat is good but it doesn’t fit on a bike with a frame-fixed front carrier. That’s why we don’t mention it anywhere. The original Bobike Mini remains the best all-around front seat. The Yepp has nice materials but it doesn’t fit well with a front carrier because the footrests are two wide and far forward. 1. Can disc brakes can be installed? If not what is the best combination for wet, mud, sand, hills, and hauling groceries? 2. Can I get the heavy duty chain and the nearly flat proof tires that are on the fr8 industrial installed on the fr8 city? 3. Will the fr8 fit on the bike racks that are on the front of city buses? I know that the bike is heavy, but I will occasionally need to ride the bus the bike the rest of the way. 4. Once I place my order, approx. how long will production take? 1. Disk brakes are not available on the Fr8, Gr8 or Kr8 but the very powerful and low maintenance Magura hydraulic rim brakes are an option. 2. Sure, no problem and they only cost a little more. However there’s a reason we don’t fit these tires standard to the city spec bikes: They’re much heavier and don’t ride nearly as well as the normal Schwalbe Big Apples which are already quite puncture resistant. 3. Fr8 owners have posted info in the @WorkCycles Facebook Group about their bikes fitting on the bus racks in various cities. If I recall correctly it fit on at least the Chicago buses. I’ve never seen bike racks on buses in Europe so we don’t have any direct experience here. 4. Lead time is normally about six weeks, depending on the number of special features in the order. However (2014) it’s been super busy this year and we’re averaging more like 8-9 weeks with some bikes taking considerably longer. Please don’t order your bike at the last minute. 7/8″ crutch tips fit well on the feet of the Massive Rack parking stand, if the original plastic feet wear away (in case anyone else is looking for this information). We have a new, much better foot solution for the Massive Rack. Thick rubber plugs with steel cores screw into threads in the ends of the legs. These can be retrofitted into older Massive Racks as well. I noticed that your updated your child seat compatibility chart and now state that two Qibbel Junior seats can fit with the rider’s saddle moved forward with a different seat post. Can you elaborate on what type of seatpost is required? Thanks. Hi Melissa, Normally we fit a seat post with the clamp about 2cm setback. With pretty much any double seat in back, but especially two Qibbel 6+ it’s handy to have the clamp forward of the post. You can do that with any straight 31.8mm seat post and an old fashioned saddle clamp. The trick is finding a seat post long enough. The normal Fr8/Gr8/Kr8 post is 400mm. WorkCycles stocks straight 31.8mm posts in 350mm and also the very, very long Brompton post which also fits. But even though two Qibbel 6+ seats sort of fit it doesn’t do anything that the cheaper, lighter, simpler WorkCycles Double Sitter can’t. I’m just about to buy a Fr8, and already own a Qibbel Maxi. I was wondering which are some of the best panniers which will work under the Qibbel? There won’t be much space left behind the Qibbel so the panniers will have to be small. I know the Clarijs XL’s won’t fit. Maybe something shorter like a set of Ortliebs or so, though preferably not with a roll-top since that will be difficult to use under the seat. Fortunately with the front carrier and a big crate you’ll already have quite a bit of luggage capacity. So far I’ve been really satisfied with the FR8. The only improvement idea that I came up with is related to the rear mudguard – it’s a few inches too short. I installed Brooks Mud flap, which took care of the problem. I did exactly the same, since the rear seat passengers were splashed with water when the road was wet. Maybe the Big Apple tires are also partly to blame.. Anyway, they stole the quite expensive Brooks mudflap after a few days, so now I’m using a classic Gazelle rubber mudflap. The FR8 is a fantastic bike, I’ve been riding it now for more than 2 years! I live in Hobart, Tasmania, and there are some steep hills where the best independant grocers in Hobart perch. I’ve read extensively about the fr8 and wish not to alter its low-maintenance concept, however, “electric assist”, what’s the closest you’ve got to a solution that meets “bomb-proof” standards? ; above (2014 post) you state that the sunstar has not been tested, what’s the latest developments for electric assist with Fr8’s, if you could please? And, please add to the above entry, whether the Schlumpf drive can be adopted with the Shimano 8 gear on the Fr8. 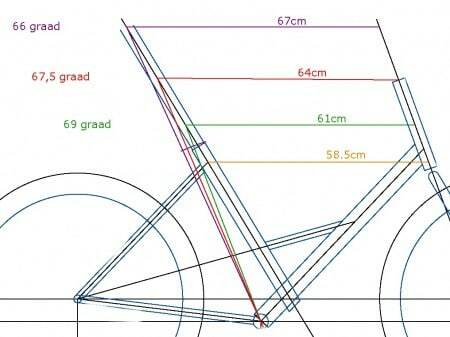 What would be the rider weight where yo would start to recommend the cross frame over the universal one? Or is it just a matter of rider height? I am 1.93m high and weight around 120kg with clothes on, hence my doubts. I also plan to carry my two kids (now 3 years) with me, so that’s around 34kg more (and growing). Thanks! You needn’t be concerned about the relative strength of the two frame types. Nobody has ever yet broken a Fr8 frame and they’re both incredibly stiff. Even height wise it doesn’t matter. I recommend the Universal frame for you just because it’s handier with the kids and also for sharing with a partner/babysitter etc. If you just want the Cross frame because you like it better though, by all means do so. Thanks a lot for your quick response! Peace of mind achieved. How much load can the City carrier carry? I’m a little unsure if I should take this one, or the massive rack. I would use the rack mainly for shopping, it has to carry a crate of beer + everything I can put on top of that. Sometimes It’ll have to carry a big bag of animal food (25kg), and when in need I want to be able to carry 1 or 2 bags of cement (50kg). Johan, I suggest only choosing the Massive Rack if you’ll need its capacity quite regularly. 25kg is absolutely no problem for the City carrier and it’s also plenty strong enough for an occasional ride with 50kg (except for on rough cobbles for example). You might also consider strapping one of the bags of cement across the rear carrier to spread the load. Johan, Just to add to the above… Since we updated the City carrier several years ago to the newer type with sheet metal mounting brackets only ONE has ever failed. That was caused by some rather extreme abuse as well: A heavy Zwarte Piet repeatedly jumping onto it during the course of the Sinterklaas Intocht. Thank you, Henry, the city carrier it is then! I don’t intend to carry no zwarte piet (or whatever we have to call them these days), but when I do I’ll pick a skinny one. Johan, Zelfs als Roze/Groene/Gele Piet 80kg weegt zal het toch lukken als ie maar niet telkens erop springt! Haha, goed om weten, als ik er eentje vervoer zal ik er een snelbinder om doen. Sorry dat ik je nog eens lastig val, maar ik heb nog een vraag over die city carrier. Ik zou plooiboxen willen gebruiken om boodschappen te doen (die gebruik ik nu ook altijd, met de auto dan wel te verstaan, ze passen precies in de winkelkar), en zou er twee willen stapelen dan op de voordrager (1 is te klein). De boxen meten D 37 x B 53 x H 27 cm. Ze kunnen beladen worden tot 30kg, maar ik denk dat ze meestal wat lichter zullen zijn. Als ik de gebruikte boxen op de afbeeldingen bekijk, lijkt het me dat die twee plooiboxen dan een heel stuk boven het stuur zullen uitkomen. Is dit te doen, denk je, of zal ik een andere manier moeten bedenken om boodschappen te doen? Op het achterrek zou een kinderstoeltje komen, en een fietstas maar die is al gevuld met spullen voor het werk. 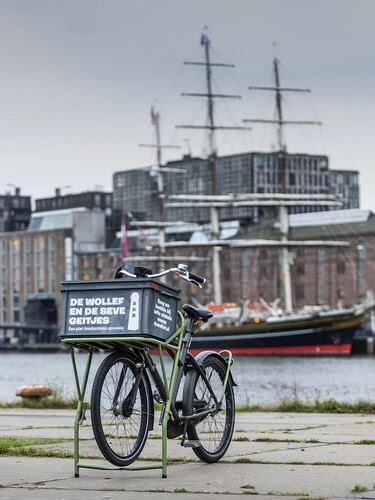 Is it possible to use a Yepp Cargo https://www.fietsweb.nl/nl/yepp-cargo-flexx-zwart instead of the City Cargo on the Fr8? Tromp, I’m sure the Yepp Cargo basket could be mounted to the Fr8 City front carrier. It would make no sense though to use the Yepp carrier for it since that mounts to the fork and turns with the front wheel instead of the Fr8’s far, far better frame mounted front carriers. You’d ruin the super handling of the bike. Johan, Over plooiboxen…. Onzer ervaring is dat ze een handig idee lijken maar in praktijk veel herrie maken. Uiteindelijk maak je nauwelijks gebruik van de plooifunctie. Zet gewoon een stevige krat op en als nodig gooi maar spullen daar bovenop. Als de stapel kratten hoger dan het stuur staat zal je niet (makkelijk of veilig) kunnen fietsen. Vergeet niet dat een kinderzitje ook als een handige cargo drager kan dienen! Een Qibbel achterzitje is er bijzonder goed voor! Bedankt voor de tips, Henry! Ik heb de FR8 proef gereden, en ik moet zeggen dat hij veel soepeler rijdt dan ik verwacht had. Ik had helemaal geen last van extra gewicht of zo. 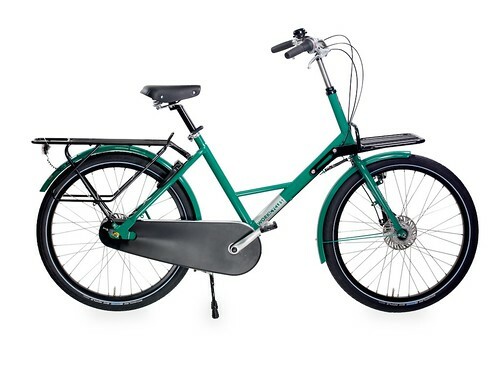 Zodra mijn huidige fiets het begeeft (hopelijk binnenkort) ga ik er mij hoogst waarscijnlijk een aanschaffen. Ik heb thuis een plastic krat van 60 op 40 euronorm). Zou dit passen op de gewone voordrager denk je? Er zitten gaten genoeg in om het met spanbandjes vast te zetten. Ik twijfel ook nog tussen de rollerbrakes en de terugtraprem. Op mijn huidige fiets zit een terugtrap rem, dat ben ik dus gewoon. Rollerbrakes heb ik nog nooit gehad, maar ik veronderstel dat die slijtgevoeliger zijn dan de terugtraprem? Het grootste voordeel van rollerbrakes is dan volgens mij dat je je pedaal kan terugdraaien wanneer je stilstaat om vlotter te kunnen vertrekken. Leuk te horen dat de Fr8 je goed bevalt. Ja, je kunt een 60x40cm krat op de City drager monteren. 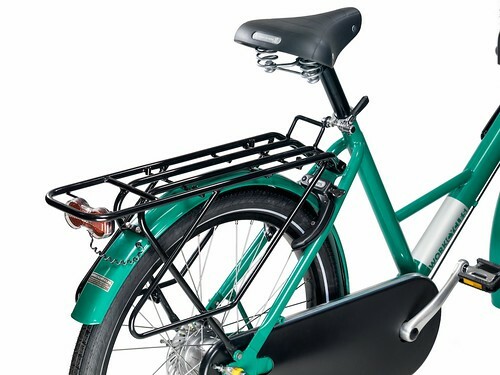 Enige nadeel is dat de fiets wat minder stabiel staat op de standaard. Rollerbrakes vs. terugtraprem: Is vooral een kwestie van waar je gewend bent. Rollerbrakes zijn in principe grotere, degelijkere remmen dan terugtrapremmen en als ze goed gesmeerd blijven gaan ze lang mee, zeker langer dan een terugtraprem mantel. ja, het is wel handig om je crank terug te kunnen draaien als je stilstaat maar daar kun je ook prima zonder. My husband Matt bought a fr8 bike from you when we lived in Amsterdam. Now we live in hilly San Francisco and would to add an electric assist wheel. What should we buy? Groeten uit A’dam! That’s a tough one for me to answer from here because there are many motors and kits available, many of them assembled by local outfits. For a hub motor to haul you up the steeper SF hills it’ll have to be a very powerful one, which usually means it’ll also be heavy and have no internal freewheel mechanism, making it much harder to pedal without the assist. Another approach is a crank motor such as from Sunstar or Bafang. The latter is popular though in it’s standard form it has “issues”. Many outfits upgrade them in various ways. Thus I’d highly recommend asking around locally. The people choosing, installing and maintaining the electric assist system are probably more important than the maker of the components themselves. If your Fr8 isn’t already equipped with the Magura hydraulic rim brakes we can supply these. We gebruiken de Bobike 1118 voetsteunen. Die zijn prima dingen en echt niet kapot te krijgen. Ik heb drie stellen op mijn eigen Fr8 (één vóór en twee achter) en ben heel blij dat ze opklapbaar zijn. Anders zou ik met mijn kuiten en schenen regelmatig tegenlopen. Ik ken geen vaste voetsteunen maar mocht je toch je eigen willen maken zou het niet moeilijk zijn. Je kunt bij voorbeeld korte stukken 20mm buizen met lange M8 bouten (bouten + draadeind met verlengmoeren) doorheen vastschroeven. Skateboard grip tape erop en klaar. I’ve just ordered a Fr8 V8 for my wife in Ireland! I’m really looking forward to it arriving. I also have a Qwik N7.1. I’m currently looking at rack options for my car. Can you advise on the weight of the V8 (with city carrier and rear carrier). The Witter racks seem to be a good option here, but they state a maximum weight per bike… so I’m not sure. Congrats! Good question; We’ve never actually weighed a Fr8 V8 so I’ll have to guess that it’d be roughly 6kg more than a regular Fr8. That’d put it at about 32kg. We’ve no direct experience with bike carriers for cars but the topic has been discussed in the @WorkCycles Facebook group a couple times. You should be able to search for the threads. Good luck and enjoy your Fr8 V8! I am 5’8″ 400lbs — I have a 26′ inseam. What combination/accessories would you suggest? Basically there isn’t much on a Fr8 that isn’t suitable for a 400lb rider but the NuVinci hub and Magura hydraulic brakes, together with a handful of small upgrades (rims, pedals, chain…) works best.